Using Bedtime Math at home as little as once a week boosts math performance significantly, according to initial findings from a five-year longitudinal study led by University of Chicago psychologists. The findings appear in the October 9 edition of Science, a leading peer-reviewed research journal. The University of Chicago study is examining how much elementary school-age children across all income levels enjoy math, and the extent to which it correlates with performance. Research has shown that children who begin school behind their peers in math tend to stay behind in later grades. The study is also observing the effects of parental math phobia on their children’s academic performance. The University of Chicago study, led by Talia Berkowitz and Marjorie Schaeffer, consists of 587 firstgrade families from 22 schools in the Chicago area. 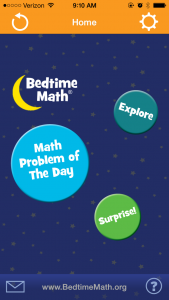 Families were given an iPad installed with a version of the Bedtime Math app with which parents and their children read stories and answer questions involving math, including topics like counting, shapes, and problem solving. A control group received a reading app that had similar stories without the math content and questions related to reading comprehension instead. Children’s math achievement was assessed at the beginning and end of the school year. Parents completed a questionnaire about their nervousness around math. Credit: Bedtime Math. I have reviewed in the past and recommend highly.